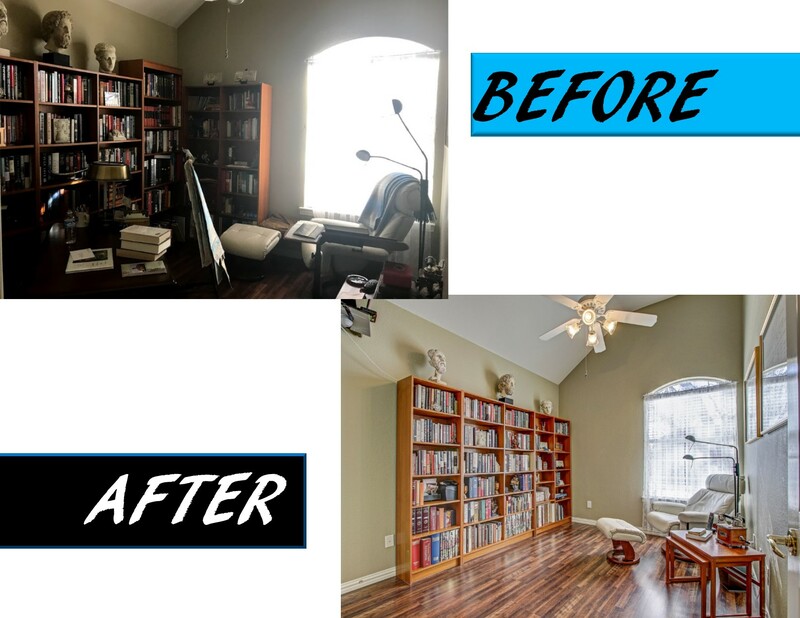 See more before and after staging photos, click photo below. For the past three months the average selling price of a staged home was 19% above the listing price while the unstaged home was only 15%. The 4% difference more than paid the staging cost. For this reason Alicia Duffy is also an Accredited Staging Professional and will offer 2 hours of free staging to all her listings! Think you can't stage a vacant home without renting expensive furniture? Yes we can! A picture is worth a thousand words with marketing your home virtually staged online and in print throughout house shows your buyers how great it could be! 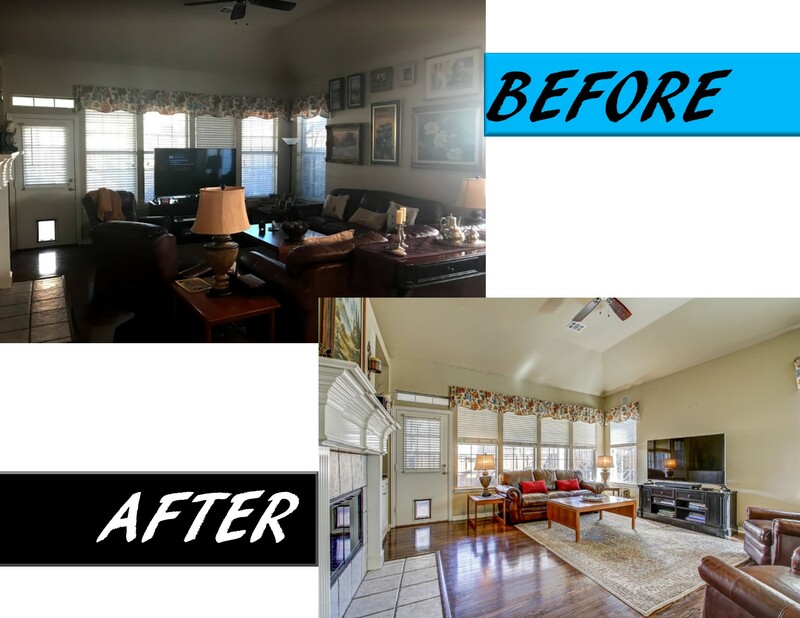 Click photo below to see full before/after photos. Removing the clutter of everyday life - all utilitarian items, stacks of paperwork, toiletries, kitchen utensils, electronic equipment and television sets. If this list seems daunting to you and your thinking I don't have any training in staging, marketing, decorating or even where to begin! Lucky for you Alicia does so let a professional come in and take care of getting your home ready to sell for top dollar then go on vacation! No really, go on vacation the houses that sell for much higher prices are homes that do not have the slightly disheveled look which comes with showering in the morning and cooking dinner in the evening. Being gone also will lower your level of stress and make the house easier to sell. Think of it this way: Your vacation will actually make you money! The way you live in your home and the way you market and SELL your property are 2 different things. 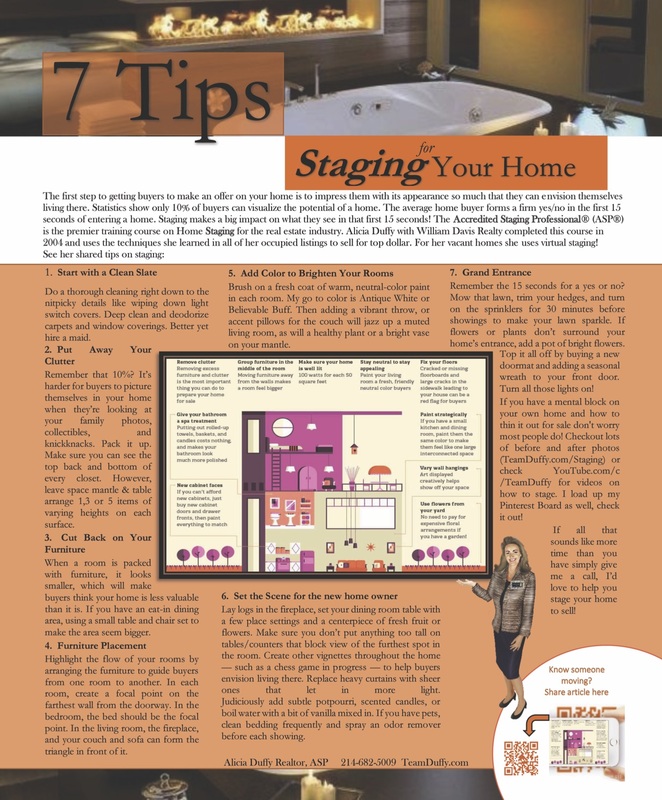 Want more Staging Tips click here for more articles! Free report To Show or Not To Show. And download Tori's Real Estate Realites Book here. Don't replace a yucky shower door: Just scour it. A grimy glass shower door can really wash out your sale. Instead of replacing it, clean it with a mixture of one part muriatic acid and about 10 parts water. Scrub with steel wool. After wiping it down, reinstall the door and you'll have a shower that'll help you clean up at the open house. Avoid dated tile by painting. Bathrooms sell houses, but dated tile in a bathroom doesn't. A low-cost alternative to replacing the tile is to use paint. First coat the tiles with a high-adhesion primer. Next, brush on a special ceramic epoxy covering. For a fraction of the cost of new tile, you will have an up-to-date bathroom that brings in big bucks. Drew Scott and Michele Kleier show you what a well-staged space looks like and share tips on staging your home. Do you have an overpowering brick fireplace that sticks out like a sore thumb? Here's an easy way to tone it down with paint. Use a rag or brush to rub a light coat of paint on the bricks, one at a time. This will give them a new tone without covering them completely. And, if you use a paint color that matches the walls, your fireplace will go from sticking out to standing out. Updating an old fireplace screen is a cheap (and quick) fix. After removing the screen and wiping it down to get rid of the dust, mask off the windows so you won't get paint on them. Then, using a can of heat-resistant spray paint, give the screen a facelift. Hold the can about 18 inches away, and use long, even strokes. For less than $5, you will have a fireplace screen that'll keep your sale from going up in smoke. New kitchen appliances bring high returns from sellers. Studies show that new kitchen appliances bring high returns from sellers, so get rid of old appliances that make the rest of the kitchen look dated. Once you install the new equipment, it will scream "new kitchen," and you will see that spending a little money will make you even more. Need to dress up a window but don't want to shell out big bucks for window treatments? Here's a trick: Use place mats. First, apply a hook-and-loop fastener to the place mats and attach them in a row to a basic curtain rod. Now that the place mats are attached to the curtain rods, pin them together at the bottom, and you'll have a stylish valance that costs about $12. Buyers love built-in bookshelves. There's a fine line between filling them with clutter and staging them to sell. The trick is to arrange neutral items in clusters. Make sure that no single accessory stands out too much. That way, you'll show off your attractive built-ins, and not your personal belongings. Curb appeal is vital to attracting buyers. Here is how to stop traffic using color. First, with two tones of paint, add a faux finish to any corner keystones. Next, bring out the color of walkway pavers using a stone sealer. Plant flowers in bloom, and you'll have buyers swarming like bees to your front door. Staging rooms to show off their true potential is essential when selling your home. Clear out clutter or other personal items that will distract buyers. Paint the walls a neutral tone, and furnish the space to show off how functional it is. When buyers come through and imagine themselves there, you can bet an offer isn't far behind. A shabby wood-panel wall is not a strong selling point. Instead of ripping it out, cover it up. Use wood filler to carefully fill in all the cracks between the panels. Then, use a sponge to wipe away the excess filler. Once it's dry, paint the room. You'll see an unattractive wall go from standing out to blending in. Use tape outlines on the floor instead of actually moving furniture around. Rearranging a room to stage it for your open house? Here is a tip to save time and effort: Instead of lugging the heavy furniture around the room to see what feels best, put outlines on the floor with painter's tape. Arrange the room according to your outlines, and save your energy for counting offers. Vinyl tile is an inexpensive way to update your home. Laying vinyl tile is an inexpensive way to update your home, but there's a right way and a wrong way to do it. You need to avoid laying patterns that look too perfect. Instead, make sure to switch up the direction and placement of the tiles to mix the tones. That way, you end up with a floor that has a natural feel. Let the sun shine in. Buyers love light and airy living rooms, but dark and dingy isn't on their list. Open up your window shades to let some light in. Cheat some sunshine with a light-colored paint and lots of artificial lighting. You can never have too many lamps. Last, arrange the space with lightly colored furniture, and you'll have a living room that brightens your chances of a sale. Unpleasant pet odors won't win over buyers. We all love our pets, but unpleasant pet odors can make a negative first impression. Be sure to get rid of old carpet that can trap offensive smells. Replace it with fresh new carpet in a neutral color. Plus, if you paint the walls to match, your living room will look bigger. It'll go from designed to smell to designed to sell. Storage space sells! Potential buyers love homes that have lots of storage space. Since they will open your closets, it's a good idea to clear out unnecessary clutter, and organize your shelves to show off how much storage you really have. Plus, it gives you a chance to start packing, as you will definitely be moving once buyers see all that closet space.